I recently caved to my childish attraction to shiny Disney goodies and purchaed one of the Disney park exclusive poison apple mugs off eBay after seeing them in my Instagram feed. 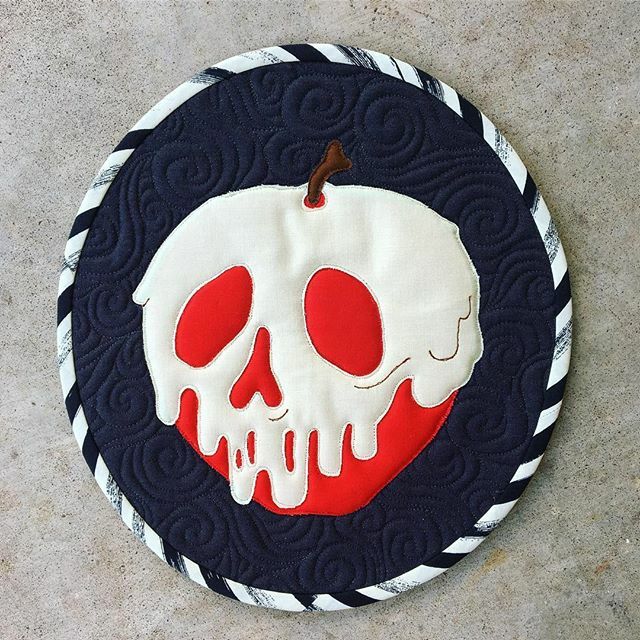 I realized that the classic Snow White icon would make a cool Halloween decoration in the form of a mini quilt, so I got to work. I traced a screenshot of the poison apple in Adobe Illustrator to make my templates, and picked a few Kona solids from my stash. I used Kona Lipstick, Meringue, and Chestnut for my applique, a black Artisan Cotton from Windham for the background, and a Cotton + Steel striped print for my binding. To make this mini, download the templates and print them at 100%. Use the background template to cut out your background oval. Trace each of the applique templates onto the paper side of a paper-backed fusible web (I used Pellon Wonder Under), and fuse to the wrong side of your fabric. Cut out your templates, remove the paper, and fuse the pieces to your background. Stitch around the pieces to secure them (I do this in one step when quilting). Embroider along the dashed lines if desired. I used my FMQ foot and brown thread because I wasn't in the mood for hand embroidery. Make your quilt sandwich (I like to use two layers of batting for extra dimension), and quilt as desired. Make 42" of 2.5" wide bias binding and bind your mini. If you post your mini on Instagram, use the hashtag #PoisonAppleMiniQuilt so we can see your handiwork! What a peculiar mug! How odd that it comes with grapes or pineapple! But it is a very cool item, and made for great design inspiration. Felice, this is great interpretation of the poison apple, much more menacing than the Disney mug. I love it! Thanks for sharing.